Rudra, the god of destruction rules Ardra, the 6th Nakshatra, which is symbolized by Betelegeuse, the star of Orion’s shoulder. Representative of the Universal consciousness split which occurred when Rudra (an alternate form of Shiva) brought down Orion. 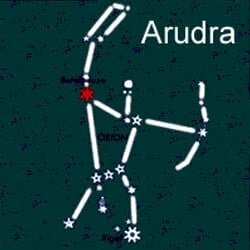 Ardra, the head of a deer, is a reference to Orion taking the form of an antelope immediately preceding his demise. The Ardra birth star is a power star, often symbolized by a teardrop or human head. 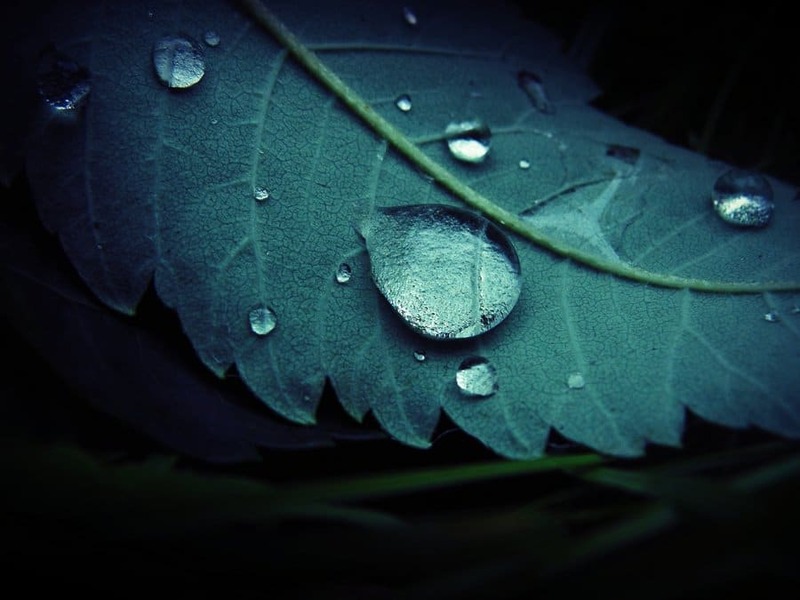 As suggested by the teardrop symbol, there is a sad destructive quality to the Ardra native. They tend to create chaos wherever they go and as such embody the Universal split. Resilient creatures, they can create something from nothing, like to ‘up-cycle’ discarded items and prefer to fix what is broken rather than purchase a new one. They may lust for power, money and material things and may be perceived as cold and calculating in their quest for success. According to Vedic astrology, Ardra natives tend to be ‘tough on the outside and soft on the inside’. Their emotional nature is often hardened by their relatively challenging life paths. The numerous obstacles and personal sacrifices they are forced to make can leave them emotionally scarred, angry and aggressive. They have a strong sense of pride and it is difficult for them to let go of anger. There is something about the Ardra that makes them noticeable among the crowd. It’s not beauty or fame, it’s an engaging presence that draws others to them. The strong, dominant personality presents itself as a stable persona with a rough exterior. Able to ‘see’ infinite possibilities for all situations, they have strong intuition and are known by friends and family to be excellent confidants. Deeply attached to their children, they tend to hold them close, yet have little influence in their upbringing. Known for their self-destructive tendencies, the Ardra will need to be mindful not to create too many obstacles for themselves. Good planetary placements can minimize their negative tendencies and maximize their potential for success. Bestowed with excellent earning potential, these intelligent individuals are adaptable and can thrive in a broad range of professions. They tend to have more than one career in their life time, will perform with excellence in all their endeavors but generally don’t receive the admiration and acclaim they so deserve. The Ardra is known to succeed in research careers, transportation, communication, publishing and import/export. Known to spend more time on work than family, Ardra marriages are challenging and lacking in satisfaction. Their persistent absence may make it difficult for them to bond with their children. Their conflicted temperament may result in chronic depression, alcohol and drug abuse, and ultimately early death. Common health issues include heart problems, lung disease, hearing issues, dental problems and paralysis. They can promote self-healing by cultivating their sense of gratitude, working to overcome diversity and through the realization of their self-worth.